Transforming Climate Finance and Green Investment with Blockchains establishes and analyzes the connection between this revolutionary technology and global efforts to combat climate change. The benefits of blockchain come through various profound alterations, such as the adoption of smart contracts that are set to redefine governance and regulatory structures and transaction systems in coming decades. Each chapter contains a problem statement that describes the challenges blockchain technology can address. The book brings together original visions and insights from global members of the Blockchain Climate Institute, comprising thought leaders, financial professionals, international development practitioners, technology entrepreneurs, and more. 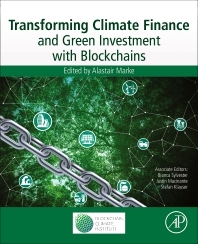 This book will help readers understand blockchain technology and how it can facilitate the implementation of the Paris Agreement and accelerate the global transition to a green economy. Section 1: Scene-Setting - What’s Going On? Chapter 3: Blockchain 101: What is Blockchain and How Does This Revolutionary Technology Work? Chapter 19: Networked Carbon Markets: Permissionless Innovation with Distributed Ledgers? Alastair Marke is currently a senior climate finance consultant with a listed company in London. He is a seasoned sustainability policy researcher with publications covering a wide range of policy issues, including food and energy security, climate finance, low-carbon investment planning, emissions trading, and associated green growth issues in Europe, Africa, China, Southeast Asia and Australasia. Seeing the dire need to accelerate global efforts to fill the current climate finance gap, on top of his consultancy work, Alastair has recently created the International Core Group on Blockchain Climate Finance, composed of over 40 experts from 20 countries, to study the potential of Blockchain technology to upscale sustainable, environmental and climate finance for developing countries, encompassing energy finance, carbon trading, and new cryptocurrency-based multi-level climate finance transfer mechanisms.